The Canadian rock trio Rush will draw from an impressive song catalog spanning four decades on its current 30th anniversary tour, including classics such as "New World Man," "Tom Sawyer" and "Freewill." The band also is performing tracks from its newest album, "Feedback," a collection of favorite songs by other acts, including rock standards such as "Summertime Blues," and "Heart Full of Soul." But it is another song in the Rush repertoire that concertgoers should pay close attention to when the band performs in the Bay Area July 9 and 10. 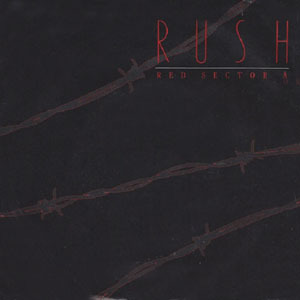 Though "Red Sector A," like much of the album from which it comes, is set in a bleak, apocalyptic future, what Lee calls "the psychology" of the song comes directly from a story his mother told him about the day she was liberated. In fact, when Manya Rubenstein looked out the window of a camp building she was working in on April 15, 1945, and saw guards with both arms raised, she thought they were doing a double salute just to be arrogant. She did not realize British forces had overrun the camp. She and her fellow prisoners, says Lee, "were so malnourished, their brains were not functioning, and they couldn't conceive they'd be liberated." It is easy to see why Manya Rubenstein had given up on civilization. She and future husband Morris were still in their teens — and strangers to one another — when they were interned in a labor camp in their hometown of Staracohwice (also known as Starchvitzcha), Poland, in 1941. Prisoners there were forced to work in a lumber mill, stone quarry, and uniform and ammunition manufacturing plants. From Staracohwice, about an hour south of Warsaw, Manya and Morris, along with many members of both their families, were sent to Auschwitz. Eventually Morris was shipped to Dachau in southern Germany, and Manya to Bergen-Belsen in northern Germany. Thirty-five thousand people died in Bergen-Belsen from starvation, disease, brutality and overwork, according to information from the U.S. Holocaust Memorial Museum. Another 10,000 people, too ill and weak to save, died during the first month after liberation. Lee told his mother's story to band drummer and lyricist Neil Peart, and "Neil took that sentiment and wrote [the lyrics to] 'Red Sector A,'" says Lee, who wrote the music. For a song that's supposed to be set in some unstated, undated future, lyrics such as, "Ragged lines of ragged grey/Skeletons, they shuffle away/Shooting guards and smoking guns/Will cut down the unlucky ones," sound realistic and reportorial. Perhaps it is the music with its pounding drums, chilling guitar and ominous synthesizer that transport the listener to a yet-to-come time and place. But maybe it is simply easier for Lee to deal with this song as metaphor instead of family history. Unlike many Holocaust survivors, Lee's parents did not bottle up or hide their experiences. Lee began hearing the horror stories as early as age 8. Though his mother insists she never spoke to her children about the Holocaust when they were young, Lee remembers the stress and nightmares the stories triggered. "These were the things that happened to them during the most formative time in their lives. Some people go to horseback riding camp; my parents went to concentration camp," Lee says. The couple gave their children a Jewish education, and Lee had a bar mitzvah at 13. Unfortunately, his father died the year before from chronic health problems that took root in the camps. Today, Lee considers himself a cultural Jew. His mother, like many Holocaust survivors, was overly protective of her three children. During Lee's teens, which he describes as "a selfish time," he distanced himself from his parents' history, and also discovered rock 'n' roll. Singing in a rock band, Lee says, "was me yelling back" at authority. It was well after Morris Weinrib died that an aunt told Lee his father had played the balalaika at bar mitzvahs and weddings, but he had purposely kept that fact from his children. "He didn't want us going into music as a career," Lee says, adding, "It was a great feeling to know he was musical." Lee was 16 when he formed the first incarnation of Rush with guitarist Alex Lifeson and drummer John Rutsey in 1969, and released their debut album in 1973. Current drummer and band lyricist Neil Peart joined in '74, thus the 30-year celebration now. "Red Sector A" is not the only song Lee has written based on his mother's life. Lee's solo album, "My Favorite Headache," released in 2000, includes the song "Grace to Grace," which he co-wrote with fellow Canadian Ben Mink, a multi-instrumentalist and another child of Holocaust survivors. The song, Lee explains, is partially about his mother's courage, survival instincts and "her ability to keep her head up" though all of the horror she lived through. Lee's mother, along with the rest of Canada's Jews, has been reminded of Hitler's Germany by a wave of anti-Semitism that included the April fire bombing of a Jewish day school in Montreal. The rise in anti-Semitism in Canada, Lee says, "is upsetting to all of us. ... There is no such thing in the homes of Holocaust survivors as 'It can't happen here.' They always feel it can happen again. My mother [has] never felt secure again." Except for possibly one time. In 1995, Lee, his older sister and younger brother accompanied their mother back to Germany to celebrate the 50th anniversary of the liberation of Bergen-Belsen. They met many other survivors as well as British army veterans who had liberated the camp. Their mother also took them back to her hometown in Poland and the house in which she grew up. "The Holocaust doesn't go away," Lee says. "My mother still has a tattoo on her arm, but that was a great trip for her, a completion of something. It made her feel fantastic to stand on those grounds with her children. For the first time she felt like a victor, like, 'I'm here and you're not!'" Rush performs 7:30 p.m. Friday, July 9, at Shoreline Amphitheatre, Mountain View, or 7:30 p.m. Saturday, July 10, Chronicle Pavilion, Concord.